Soft Cover Price: 9.99 FREE SHIPPING IN US! Hardback Price: 18.99 International Shipping also Available! AUTOGRAPHED! 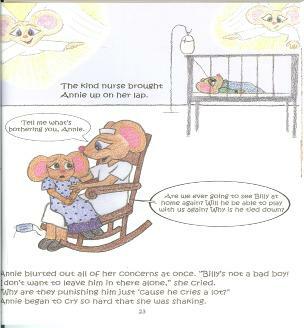 The Adventures of Annie Mouse: Baby Brother Goes to the Hospital is the second in a series of Annie Mouse books intended to help adults guide young children through difficult situations. In this episode, Annie Mouse looks on in silence as Mommy and Daddy Mouse cope with Baby Brother’s illness. When Baby Brother goes to the hospital for an operation, Annie is told that Baby Brother must stay in the hospital until he is “better,” she mistakenly believes that Baby Brother is being punished for being bad. She also confuses the hospital crib for a cage. Annie is angry with her parents until a kind nurse listens to her fears and helps her understand what is happening. When parents are faced with a child in a medical crisis they are, quite understandably, consumed with that child’s care, making it easy to overlook the impact on the rest of the children in the family. When young children do not have the opportunity to ask questions, they often develop their own reality as to what is occurring. This reality could be much more frightening than the facts, as the author learned when faced with similar circumstances. This book is intended as a vehicle to open that discussion and address any questions that the siblings may have. A great tool for helping children cope with a sibling’s hospital stay.